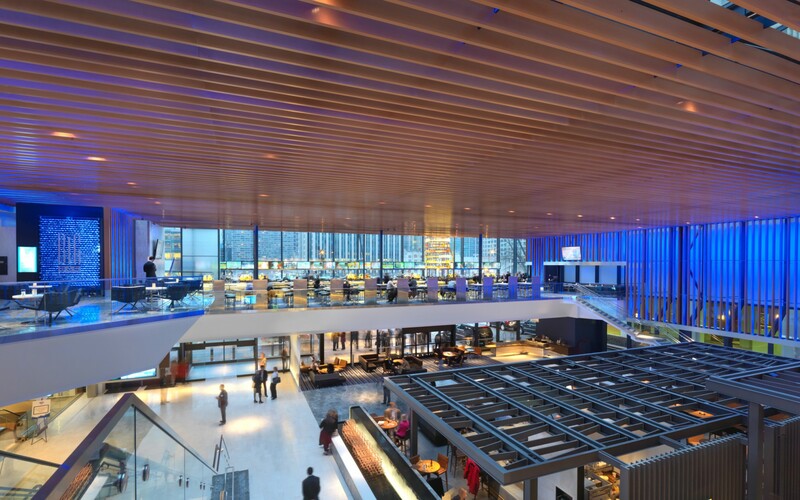 KGM Architectural Lighting partnered with Bentel & Bentel Architects to relight the lobby at the Hyatt Regency in Chicago. The firms designed a custom louver system of faux-wooden beams that frame the restaurant space and filter natural light during the day. 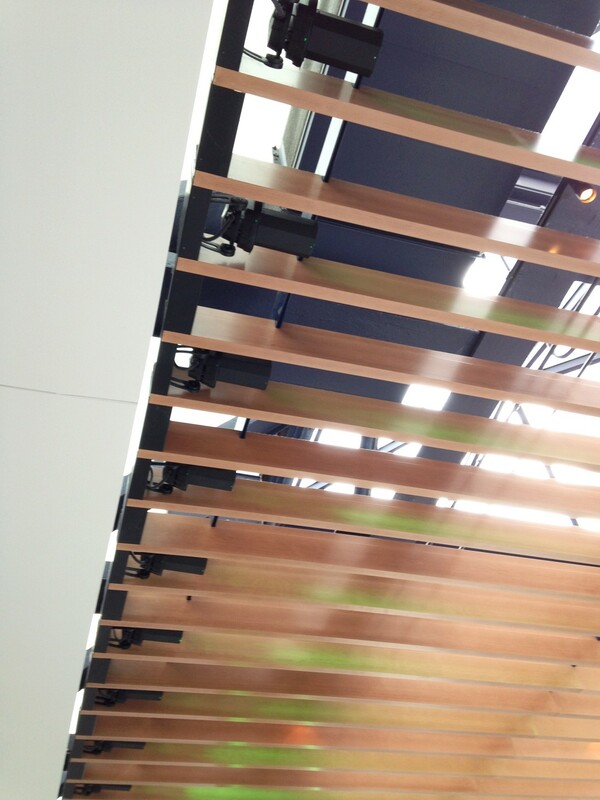 Lumenbeam Medium RGB luminaires with a 6-degree beam are mounted in between slats at the top. 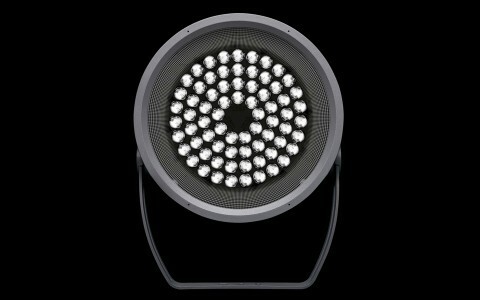 The same fixtures are recessed into the metal base at the bottom of the structure to illuminate the vertical elements. 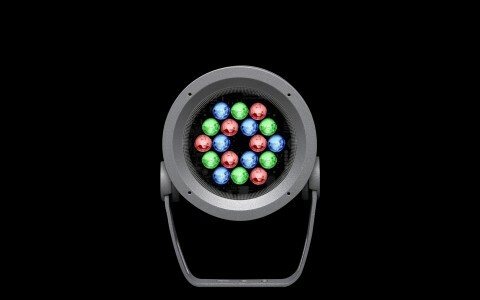 The luminaires were programmed with a variety of presets, including holiday hues and local sports teams’ colors. The system is also programmed for a gentle RGB progression that runs most days. 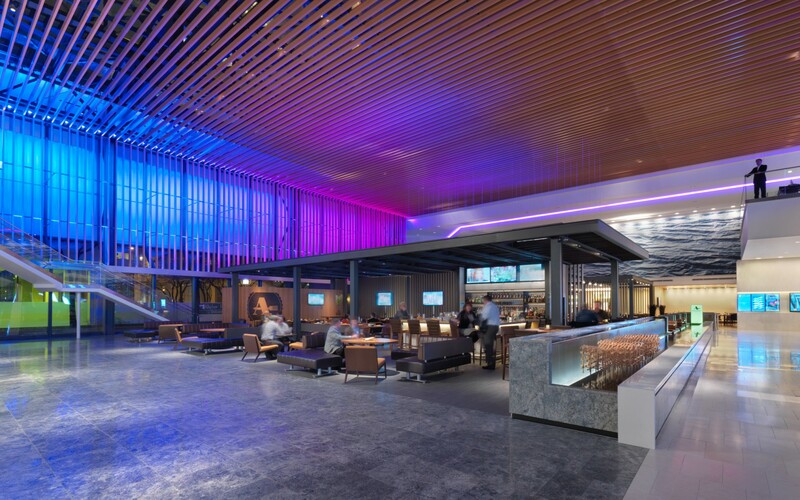 Designers Kaplan Gehring McCarrol used Lumenbeam luminaires to give the 70s-era lobby at the Hyatt Regency a dynamic, color changing lighting system. We were trying to light across a space that is nearly 150 feet long across and needed to throw light a long distance from a very small source. 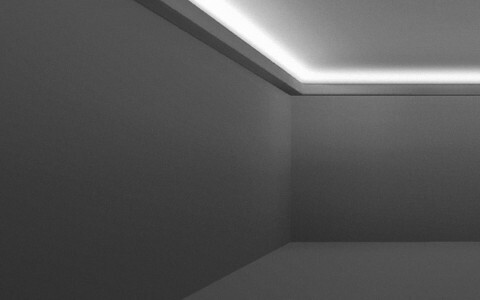 The Lumenpulse Lumenbeam Medium luminaire had the narrowest optics and performed the best. The largest hotel in downtown Chicago, the Hyatt Regency, got a bold new look as part of a recent renovation. 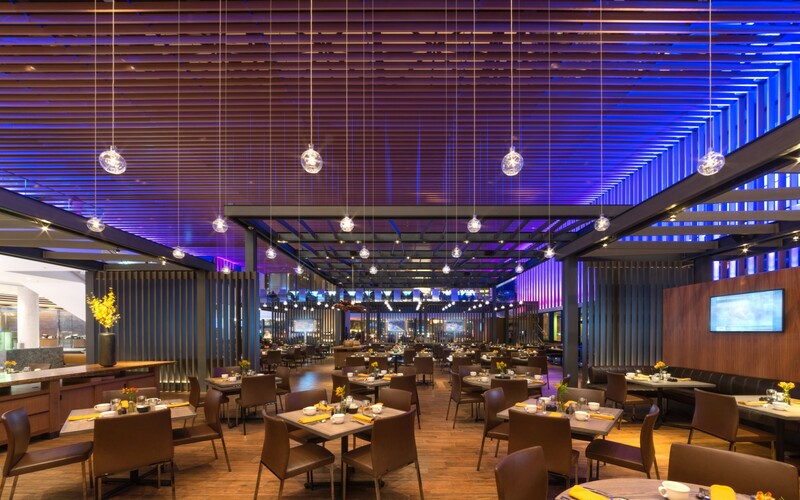 Design architect Bentel & Bentel re-imagined the hotel's 1970s-era lobby with several new eateries, including the American Craft Kitchen & Bar restaurant. 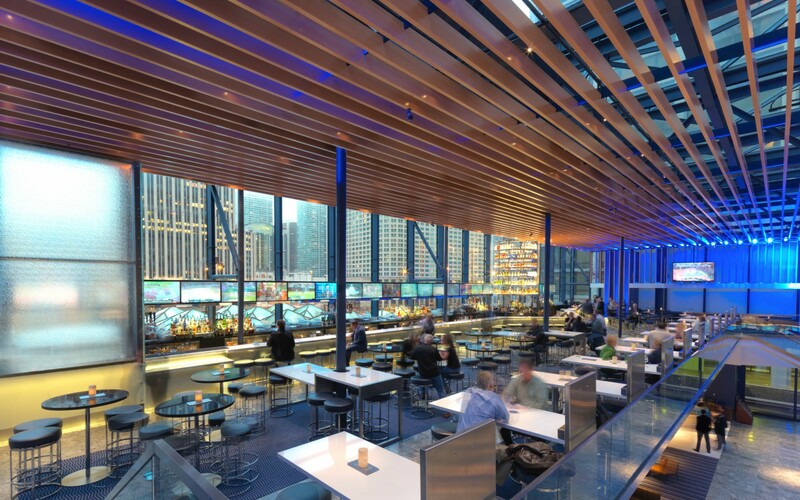 Kaplan Gehring McCarroll Architectural Lighting (KGM) partnered with Bentel & Bentel Architects to relight the space. "The challenge was that the lobby features this big, exposed atrium structure from the ‘70s that we couldn't change or renovate. 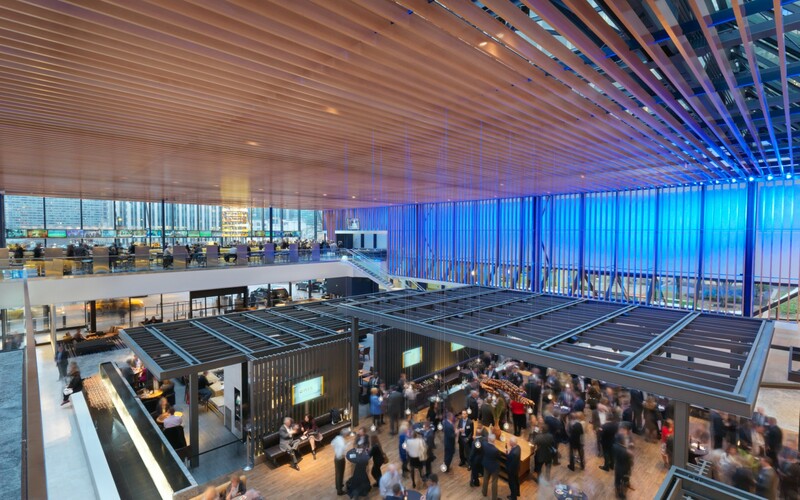 To change the look of the space, the architect wanted to mitigate the daylight entering from the atrium and introduce a system that could reflect light at night," explains KGM partner Dan Weinreber. "Meanwhile, the owner asked for a color-changing nighttime environment," he adds. 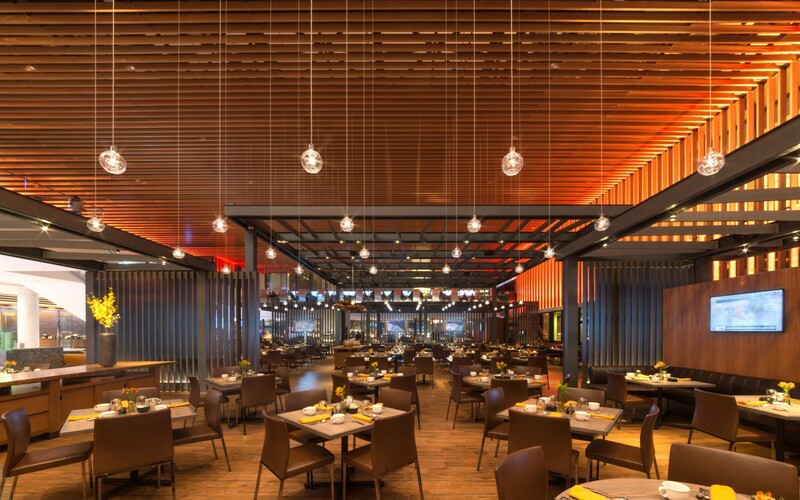 The lighting and architecture teams collaborated to design a custom louver system made of horizontal and vertical faux-wooden beams that frames the restaurant space and filters the natural light from the atrium over head during the day. Moreover, the louver system gave the team a structure around which to add dynamic illumination to the space at night. "We wanted to reflect the light off of the louvers, but not make it obvious or expose the fixtures," says Weinreber. 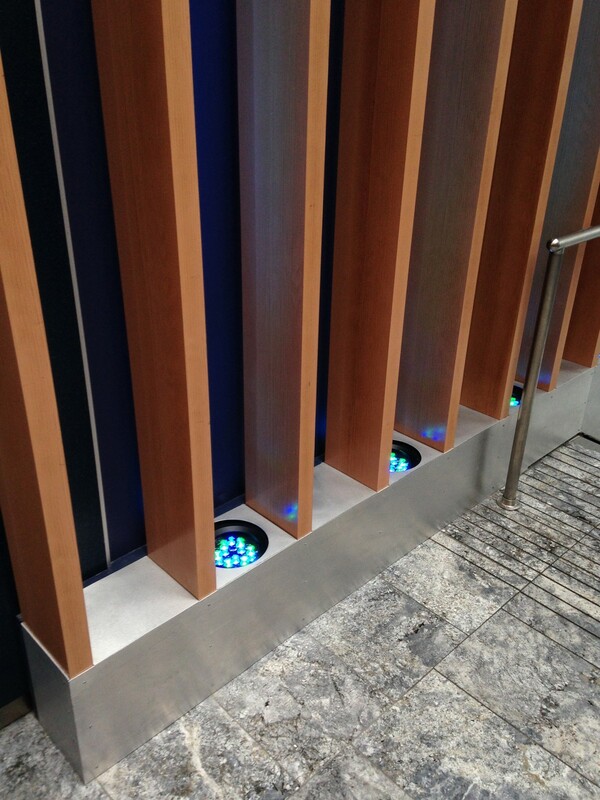 "Since we didn't have many surfaces to light off, we chose to use spotlights between the louvers." 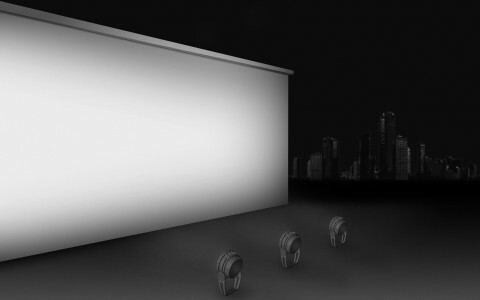 With limited space in which to mount the lights, luminaire size was paramount. So was brightness. "We were trying to light across a space that is nearly 150 feet long across and needed to throw light a long distance from a very small source. 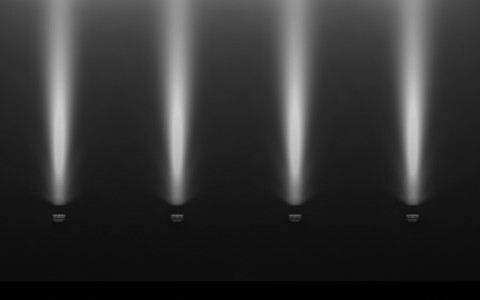 After mocking it up, we found that a couple degree difference in the beam spread made a huge impact," notes Weinreber, who tested lights from three manufacturers before selecting the Lumenpulse Lumenbeam Medium luminaire. "It had the narrowest optics and performed the best," he explains. The narrow, 6-degree-beam luminaires are mounted in between the slats at the top of the structure to light them horizontally, while the same fixtures were recessed into the metal base at the bottom of the structure to illuminate the vertical elements. The lights were programmed with a variety of presets, including holiday hues, local sports teams' colors, and a gentle RGB progression that runs most days. Weinreber also specified Lumenpulse luminaires to create a signature, nighttime identity for another area of the hotel: the façade of its east tower. As a replacement for the outdated, 1,000-watt high-intensity discharge floodlights that had previously illuminated the façade, Weinreber selected Lumenbeam XLarge floodlights to add crisp white light to the tower façade. "We looked at what was the best performing product given the set back and mounting locations," he says. "This was it."